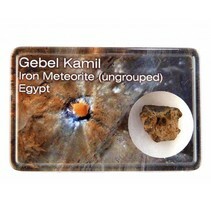 Gebel Kamil meteorite 267 grams ! The Gebel Kamil meteorite hit earth about 5,000 years ago and created a crater in the far south west of Egypt near the Sudanese border. In 2008, the crater was discovered by a team of researchers who were looking at pictures from Google Earth. After the discovery a team was quickly assembled and went to see the crater. The researchers found a crater with a diameter of 44.8 meters and a depth of 15.8 meters. 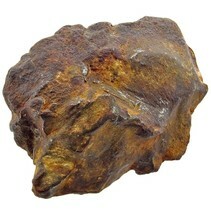 It turned out to be an iron meteorite that can not e classified in the known iron groups. The Gebel Kamil meteorite was probably around 1.3 meters in diameter and weighed 5,000 to 10,000 kilos before impact. The impact velocity is calculated at 3.5 kilometers per second.